This 12-day Antarctic Peninsula voyage offers an abundance of wildlife viewing opportunities as well as possible stops at active scientific or historic bases. Adelie, Chinstrap and Gentoo penguins abound, and Weddell and Crabeater seals are often found hauled out to rest along with predatory Leopard seals and the assertive Antarctic Fur seal. Minke and Humpback whales are frequent visitors in the late season and Orca sightings are also common. Today is all yours: explore some of the sights that Ushuaia has to offer, from museums to Argentinean leather markets, or continue relaxing at the lovely Arakur. The optional evening briefing is a great opportunity for you to ask questions and to meet some of your fellow travelers. After a complimentary buffet breakfast, you`re free to explore Ushuaia or unwind at the resort until our mid-afternoon transfer to the ship. Once on board, you`ll be greeted by our Expedition Team and the Ship`s Officers. A concise safety and orientation briefing will be followed by the Captain`s welcome dinner. After dinner, relax and take in the scenery on our early evening sail through the Beagle Channel, past Magellanic Penguin, Rock Cormorant, and Sea Lion colonies. As your ship makes its way ever closer to the white continent, numerous Polar Experts will prepare you with presentations on everything Antarctic, from wildlife to history. Eventually, you`ll cross the Antarctic Convergence where you`ll notice a distinct drop in temperature as you enter the waters of the Antarctic Ocean. Those interested in Citizen Science can take part in SeaBird sighting surveys, or help collect salinity samples and weather data along the way. You`re likely to witness some spectacular sights, from icebergs to an array of seabirds and whale species. If you`re lucky, you may see some of them fully breach from the sea. In the waterways of the Antarctic Peninsula, you will hope to make as much time as possible to explore by inflatable Zodiac boats and marvel up close at nature`s glory. Our Expedition Leader and Captain will create a flexible itinerary based on weather, ice, and opportunity. Polar Latitudes will aim for the most scenic bays and channels of the Peninsula with stops at penguin rookeries, seal wallows, bird colonies and whale feeding areas, as well as sites of historic and scientific interest. 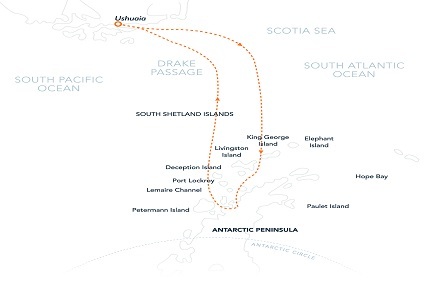 Your first sight of land will likely be that of the South Shetland Islands. These highly volcanic islands offer amazing abundance and beauty. You may visit Half Moon Island nestled inside Livingston`s eastern shore, or conditions permitting, visit historic Deception Island. Being further north, sub-Antarctic species are more commonly found here, including Chinstrap penguins and Southern Elephant seals. As you head south across the Bransfield Strait, we enter the Trinity Coast and Gerlache Strait. Here you may explore picturesque Neko Harbor, sheltered Paradise Harbor, the Humpback whale favored Wilhelmina Bay, the striking Lemaire Channel, the wildlife-filled Penola Channel, or the majestic Neumayer Channel. We may stop at an active scientific base such as Poland`s Arctowksi or Ukraine`s Vernadskiy as well as a historic base such as U.K.`s Port Lockroy or Wordie House. As you leave this magical place and make our way north, heading again across the Antarctic Convergence and the Drake Passage, you will continue our presentation series and wildlife spotting. Sailing back to Ushuaia through the Beagle Channel, we celebrate the conclusion of our expedition with a special slideshow. 10 Night Cruise sailing from Ushuaia roundtrip aboard Hebridean Sky. 1 night hotel stay pre-cruise in Ushuaia.